Perseverance in the face of adversity is very much a relative virtue. An aging baseball player trying reach a career milestone isn’t close to the same level as a soldier at war trying to stay alive. But each person overcome their own obstacles and show mettle individualized to their situation. But then there’s When The Game Stands Tall, which tells the immediate before-and-after of the Sept. 2004 end to Da La Salle High School football program’s real-life, record-setting 151-game winning streak. There are formidable reasons precipitating the loss, including an off-season health scare suffered by legendary head coach Bob Ladouceur (Jim Caviezel, still channeling Jesus) and the murder of former star teammate Terrence Kelly (Stephan James) less than a month earlier, days before Kelly was set to enter the University of Oregon on a football scholarship. But ultimately, this is the story of a California football program that doesn’t lose a game for 12 years suddenly coping with something every other team in sports history faces all the time. And once Da La Salle loses (gasp) TWO games, this otherwise pedestrian tale of uplift crosses an uncomfortable line when a tour through a VA hospital is used as the springboard for the team to bond and start winning again. Adapted by writer Neil Hayes from his book of the same name, director Thomas Carter (“Coach Carter”) weaves in the requisite genre tropes, including the star running back (Alexander Ludwig) and overbearing dad (Clancy Brown), the saintly coach and his long-suffering wife (Laura Dern), the comic assistant coach (Michael Chiklis), the egotistical star player, and a pivotal game against an all-African-American behemoth. 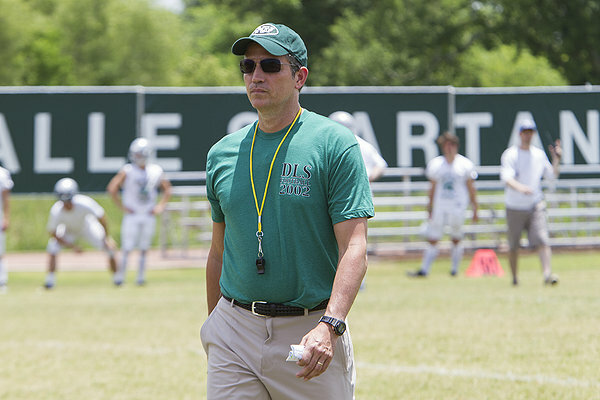 As far as high school football movies go, When The Game Stands Tall is more Friday Night Lite.